El desarrollo del IS-7 comenzó en la primavera de 1945. Los prototipos fueron sometidos a pruebas con éxito en 1946 y 1947. Sin embargo, el IS-7 nunca entró en la producción en masa. Frontal armor is tough, but relies on slope rather than thickness. If angled or shot from above, the front can be penetrated. High terrain resistance means it will never reach its top speed unless going downhill or using speed boosts. It's not fast and delivers mediocre damage while being hard to kill due to its heavily sloped front armor. The IS-7 has some of the best sloped frontal armor in the game. However this is somewhat nullified at close range by the equally thick but much less sloped lower plate. All these strengths come with a weakness; the IS-7's main gun. While having the same listed accuracy as the E-100's 15cm, in practice it seems to be worse at actually hitting the target, let alone hitting a weakspot, thus requiring the player to get fairly close to their target in order to lessen the impact of its poor dispersion values. This in turn makes you a much easier target to hit as well. 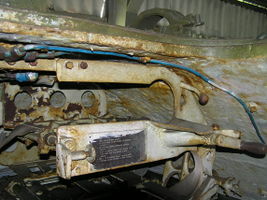 However, these sloping plates also add a disadvantage: You cannot angle the frontal armor of IS-7 as you expose the well-sloped-but-weak armor plate to the enemy, the effective armor when fighting angled drops a fair amount, allowing tier 8, 9, and 10 guns to punch through if they strike at a shallow enough angle to the plate. This in turn makes your lower plate incredibly easy to penetrate as it is just as thin as the upper plate but with far worse sloping. When fighting one at an angle, prefer its flatter front armor sections than is angled side armor, or shoot the sprocket, dealing damage and throwing off the track. If fighting in an urban environment with many street corners that force you to turn to shoot you opponent, it's advised that you bait them into shooting your thick and spaced side armor by side-scraping, then returning fire as they reload. Or if your weak lower hull exposes to enemy fires, try to wiggle or shake it so that it's harder to penetrate. This can even sometime bounces tier X TD's shots. 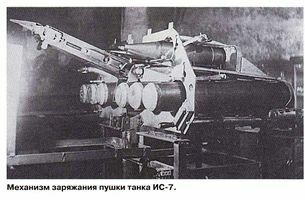 The development of the IS-7 started in the Spring of 1945. Prototypes were in trials during 1946 and 1947. 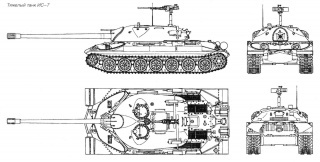 By 1948, the IS-7 heavy tank was developed. 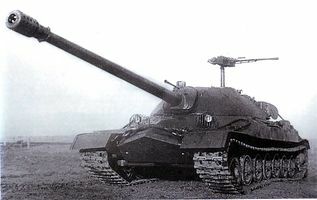 The IS-7 model 1948 variant had a weight of 68 metric tons and was armed with the 130 mm S-70 naval cannon (7020 mm long barrel) with auto-loader and stabilizer, infrared night scopes, 8 machine guns, armor from 220 to 300 mm thickness', and 60 km/h roadspeed. 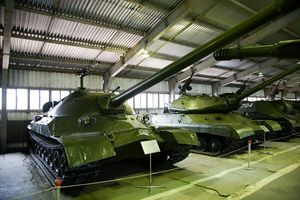 Only three were built and it was the largest tank ever produced by the USSR. Although it was in many ways an innovative design, it was never accepted for mass production due to its cumbersome size and the very impractical layout of its fighting compartment. The tank housed a crew of five. Esta página fue modificada por última vez el 25 oct 2016, a las 11:01.